Almost exactly a year ago we finally wrapped up our undergraduate project focusing on sequencing and assembling reference genomes from the built environment. 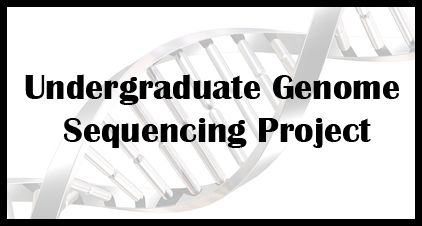 This project aimed to take undergrads through every step from starting with a swab to ending with a published genome announcement and data in NCBI. Over the course of the work, we discovered a number of unforeseen complications and snags in the process. So we set out to try it again, document every step, and to produce a workflow allowing others to do the same thing. Along the way we got a push from several people to make it a publication instead of just posting it as a web page. The most common argument was that way people could cite it in a grant application to do something similar. Recently we finally finished the paper, but had some reservations about how other people would interpret the instructions and about the possibility of “bugs” in the process. Therefore we recruited three undergraduate students to go through the process from start to finish and give us feedback. We then decided to submit the paper as a pre-print so we could likewise get feedback from anyone in the community. The plan is to take that feedback, make some changes, then submit the paper in a couple of months. This is a new process for most of us, it’s certainly my first time using a pre-print server but I certainly see doing it in the future. The sequencing, assembly, and basic analysis of microbial genomes, once a painstaking and expensive undertaking, has become almost trivial for research labs with access to standard molecular biology and computational tools. However, there are a wide variety of options available for DNA library preparation and sequencing, and inexperience with bioinformatics can pose a significant barrier to entry for many who may be interested in microbial genomics. The objective of the present study was to design, test, troubleshoot, and publish a simple, comprehensive workflow from the collection of an environmental sample (a swab) to a published microbial genome; empowering even a lab or classroom with limited resources and bioinformatics experience to perform it.